Once upon a time in a far away land of Disney's Animal Kingdom there was desire for entertainment. The designers of the kingdom called upon all their scribes to create three stories that would combine information with imagination. This is the tale of one of those shows, Pocahontas and Her Forest Friends. 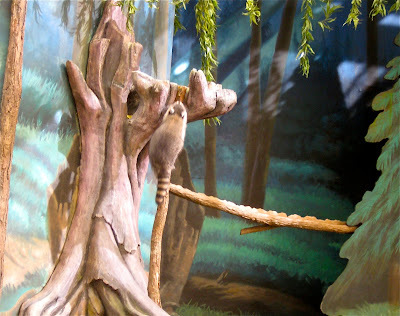 Pocahontas and Her Forest Friends told the adventures of Pocahontas, Grandmother Willow, and the original character Sprig, learning virtues from the animals found in the American wilderness. 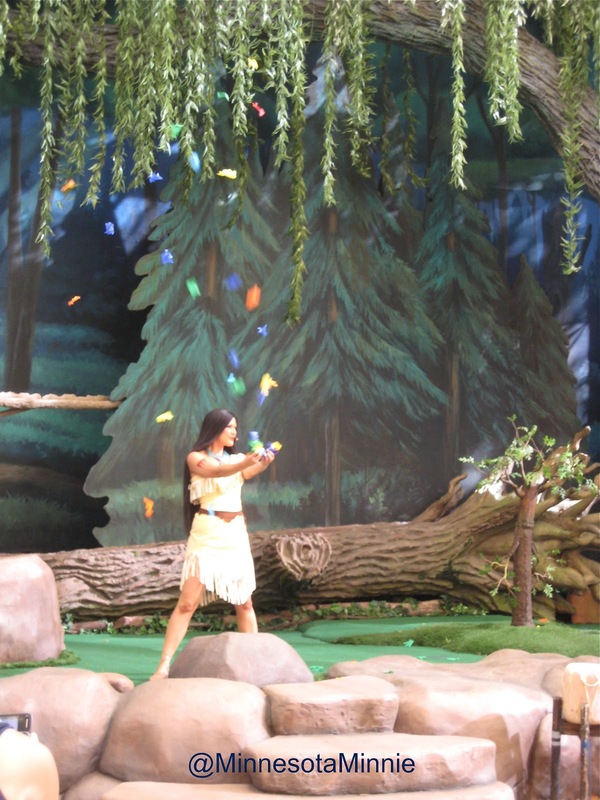 During the pre-show a child earns Junior Camp Counselor status by completing three tasks; making two sounds of an animal, and striking a drum once to call Pocahontas from the forest. Upon her arrival she explains there is an imminent threat of humans destroying the land. Grandmother Willow advises Pocahontas to look toward the animals for advice, as each passes by she links their qualities to moral lessons. Sprig is the last to catch on to the lessons, and when he does Pocahontas reminds everyone that "we can all learn from our friends the animals." She joyously releases birds as brightly colored tissue leaves swirl around Pocahontas, all the while singing "Colors of the Wind" before leaving to see her father. Grandmother Willow's Theatre was situated in Camp Minnie Mickey it was one of the central elements establishing the land's theme of "Back to Nature", located somewhere in the East Coast of the United States. An amalgam of three mountain retreat areas, the land represents the mountains of Appalachia, Adirondack, and Catskills. However nowhere was this as explicit than in the storytelling of Pocahontas' home forest. Specificity is the key to good communication, and the show extended the theming idea from a set of design elements of stick craft styling on benches and food cabins into a known location. Following the central tenets of theatre, the production raises the stakes of the land from a sleepy hollow to something to be defended. During its run the musical provided a needed counterpoint to stagger the large crowds for Festival of the Lion King. Families coming into the Camp would first encounter the Pocahontas show, and shortly after it finished would be ready to be seated in the next theatre, ending their time visiting Mickey, Minnie, Donald, and Goofy in the back cabins. Oddly, the land only offers entertainment, but the physical and temporal staggering filled the average Guest's schedule of an hour and a half. 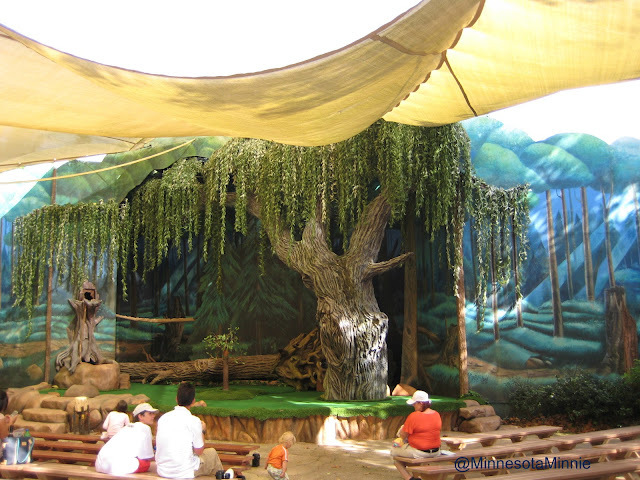 Opened with Animal Kingdom in April 1998, Pocahontas and Her Forest Friends ran for ten years, closing September 28, 2008. It contained a five minute pre-show by the Camp Counselor and eleven minutes of performance, and guests were permitted to be seated up to four minutes late. Designed for children 4-8 years old, children 12 and under had special seating in the first four rows. The show-original character Sprig stood in for these children, asking questions and repeating information. This focus on young kids was in line with the the "NotAZoo" credo to teach through entertainment. The target audience was both the key to and demise of the show, as detailed in the College Program exclusive Entertainment Production course. The aging of the source material created a population unfamiliar with the characters and stories. Without a U.S. re-release of the film, kids were not seeking out a Pocahontas experience. Some theorize Disney does not know how to situate the colonialist and Native American issues contained in the film, and thus are reluctant to face the changed attitudes from nearly twenty years ago. Regardless, the British children demonstrated the efficacy of keeping the film accessible for viewing as they regularly requested Pocahontas material, but their attendance alone was not sufficient to bolster the faltering attendance. Additionally, the animatronics for Sprig required high maintenance to counter the outdoor elements. For a show that only played four times a day, the cost per a show became harder to justify when combined with the low attendance. In the final weeks of performance Sprig regularly "waked up" in inopportune times, missing his cues and frightening Cast Members between shows (myself included). 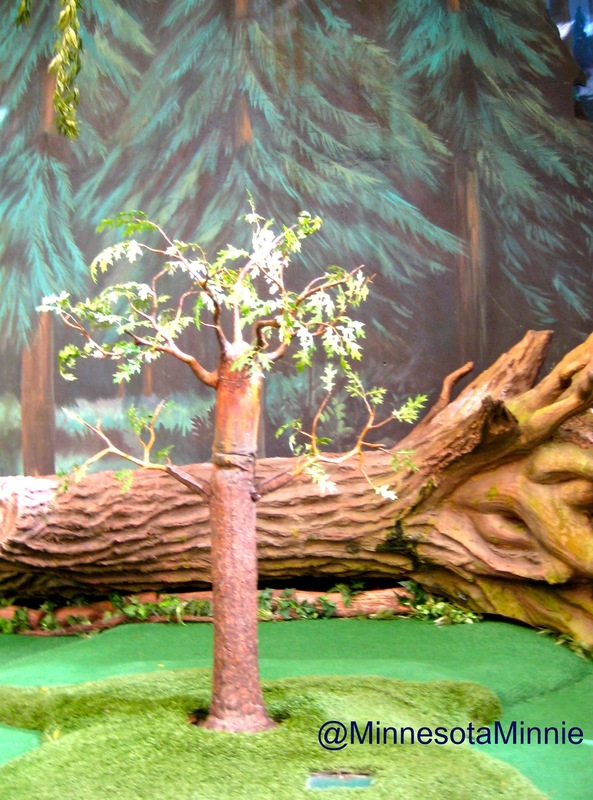 None of these elements so endeared the Grandmother Willow Theatre to me as the bi-weekly noon training show. While the main performers had their lunch break a little gem occurred. Here I learned about the care taken to acclimate the animal participants to both the show elements and the distractions of a live audience. Here I watched as children experienced their local American wildlife for the first time, without fear of disease or scolding. Here I discovered the wonder of Brother Porcupine's tender slipper feet. The animal trainers helped guide both veteran and new animals though their cues from naturally derived movements, offering to answer questions and comments from the audience along the way. Even long time fans did not realize the how many permutations and improvisation the show allowed for due to its use of natural animal habits and required animal rests. Although, the least attended show of the day, this hidden attraction tied both the ecological and experiential theme mission of Disney's Animal Kingdom. It may be NotAZoo, but in this most zoological entity lived the quiet heart of Camp Minnie Mickey. Michelle is a former Cast Member, working attractions for four years in Camp Minnie Mickey and Discovery Island. She holds a Masters of Arts degree in theatre history and theme parks.